On his quest to win the biggest trophy in the sport of reined cow horse, Jake Gorrell has taken care of the little things with the hope that one day, the big things would take care of themselves. That's exactly what happened last night in Fort Worth when Gorrell marked a composite score of 657.5 (214.5 herd/218 rein/225 fence) on Plain Catty to win the 2017 NRCHA Snaffle Bit Futurity Championship and $125,000. Bet Hes Black, owned by C Ranches Inc and ridden by Zane Davis marked a 654.5 to bank the $90,000 reserve champion's check. In Fort Worth, Gorrell knew he had a finals-type of horse if he could get him shown right. “I never know what it takes to win it. It’s persistence, consistency and trying to stay in the game. Usually if I can get to the fence work okay – because that’s probably my better event – then I kind of have a shot sometimes,” Gorrell said. Gorrell and Plain Catty, nicknamed “Sparky,” had shown in the 2017 NRCHA Snaffle Bit Futurity Intermediate finals on Thursday, where they tied for third place to earn $12,000. With the hectic schedule, Gorrell let the stallion recuperate on Friday so that he’d be ready for the Open herd work Saturday morning. Gorrell and Plain Catty marked a 214.5 in the herd work which was won with a 221 by Myles Brown and Miss Scarlets Cat (Metallic Cat x Bee Miss Scarlet x Lenas Busy Bee). In the reining, which was won by Bet Hes Black and Davis with a 223, Plain Catty used his signature stops and good circles to mark a 218. While that run put them back into contention for the top spot, Gorrell knew that he’d have to score big in the cow work if he wanted the win. But he also knew that trying to force the run wouldn’t work out. d if he should make another one or go circle. Plain Catty (Bet Hesa Cat x Miss Plain Plain x Just Plain Colonel) was ridden throughout his two-year-old year by Mark Luis. He was put through last year’s NRCHA Snaffle Bit Futurity Sale but was then taken home again by his breeder/owner Kevin Cantrelle. The colt went to Gorrell after that. For Gorrell, who is sponsored by LMF Horse Feeds, Eagle Valley Animal Bedding and Stray Dog Saddles, this win belongs to his wife Sonia, as much as it does him. The reserve champion, Bet Hes Black (Bet Hesa Cat x Soula Jule Forever x Sola Jule Star), battled a minor illness during the preliminary rounds at the Snaffle Bit Futurity. Trainer Zane Davis felt that the stallion didn’t return to his usual form until mid-way through the herd work finals. 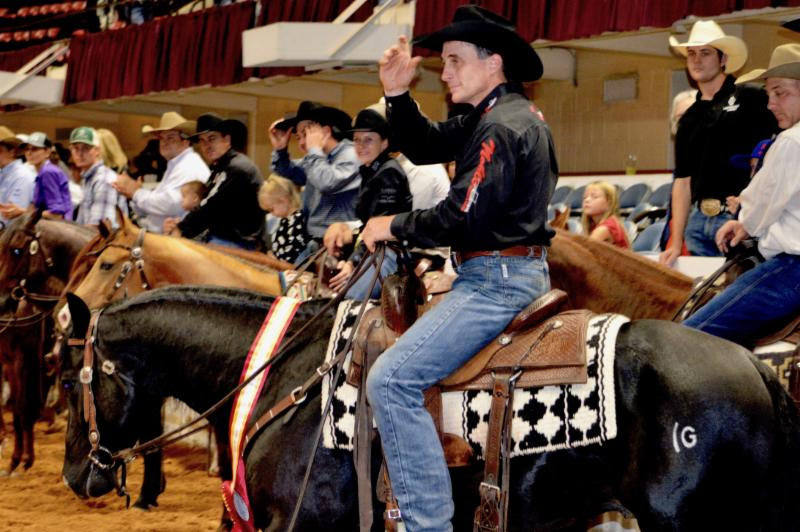 Bet Hes Black has been in Davis’s training program since he was a yearling, when owner Billie Filippini’s son, Johnny, picked him out at the NRCHA Snaffle Bit Futurity Select Yearling Sale.